When it comes to nice ways to fritter away a miserable Sunday afternoon, there's one thing we can always agree on; cooking up a yummy meal, or crafting some kind of indulgent desert. Autumn flavours are some of our favourites - sweet potato, butternut squash, salted caramel and warming spices... In the end, we decided to tackle an old classic, apple pie, but with our own personal spin - naturally! After all, we're both from the West Country, so a splash of cider never goes amiss. My last weeks in Cornwall before the wedding were spent stripping all of the nearby hedges of blackberries, then cooking them up with lots of sliced apples and baking them into crumbles. The humble crumble is all well and good, however it is the teeniest bit lazy. Since I had a little time on my hands today, I decided to be brave and attempt a proper pie. Thankfully Grant was on hand to help, and took on the somewhat tricky task of making the pastry whilst I focused on perfecting the flavours and filling. After a rather pleasant summer, the autumnal chill has finally set in. This is something I personally relish as it can only mean one thing... the apples and blackberries meet the cinnamon and nutmeg in Megan's delicious fruit crumbles. However, in a slight deviation from tradition, crumble topping has today been replaced by pastry stars in this incredibly comforting homemade apple pie. What a perfect way to spend a drizzly Sunday afternoon. I can imagine this being a frequently revisited recipe over the long cold winter! Get the boring part over and done with by peeling, coring, and thinly slicing your apples. Personally I actually like leaving the skins on, but Grant isn't quite convinced! With your apples prepped, move onto your pastry. Combine the butter and sugar, then separate the egg, adding the yolk to the mix and saving the whites for glazing, then beat the egg into the butter/sugar mixture. Using a wooden spoon, begin to work in the flour, then finish it off by gathering it together with your hands.Wrap the dough in cling film and leave in the fridge to chill for 45 minutes. Now it's time to focus on the filling! Melt the butter in a large pan on a medium heat and add the apples, sugar and cider, turning them so that all of the slices are coated. Add a teaspoon of ground cinnamon and half a teaspoon of ground nutmeg. 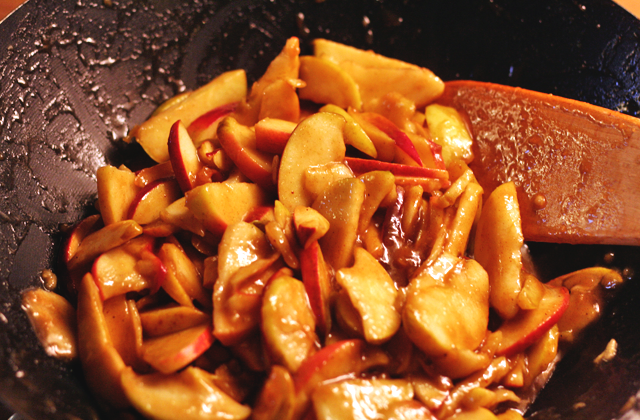 As the apples begin to soften, add extra sugar, cinnamon and nutmeg to taste. The soft brown sugar is what will give the filling it's 'caramel' taste. If you find you have a lot of excess liquid in the pan, add a tablespoon of plain flour to thicken it into a sauce. When your dough is ready, retrieve it from the fridge and begin to work it into 5mm sheet on a floured surface. If you don't have a rolling pin, don't fret! We don't have one yet either, but find a wine bottle does the trick. Line a 20cm pie/flan tin (we bought a bunch of disposable ones from Lakeland for a few pounds), and blind bake for 15 minutes. Roll out what's left of the pastry to 3-5mm thick, and cut out a selection of medium and small sized stars (or whatever shape you fancy!). 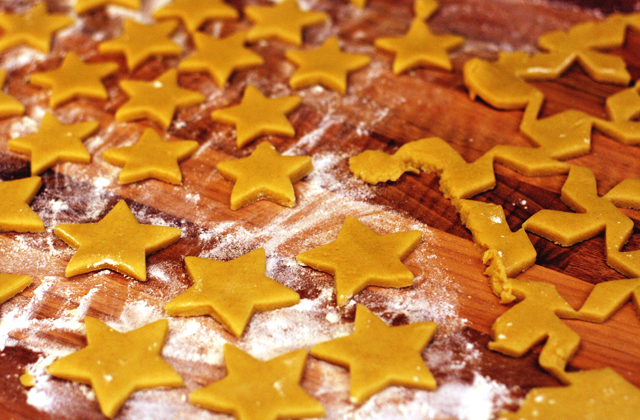 Layer the larger stars first, then fill the gaps with the smaller stars, sticking with egg white where necessary. Avoid layering them too thickly, and leave a few small gaps for steam to escape. 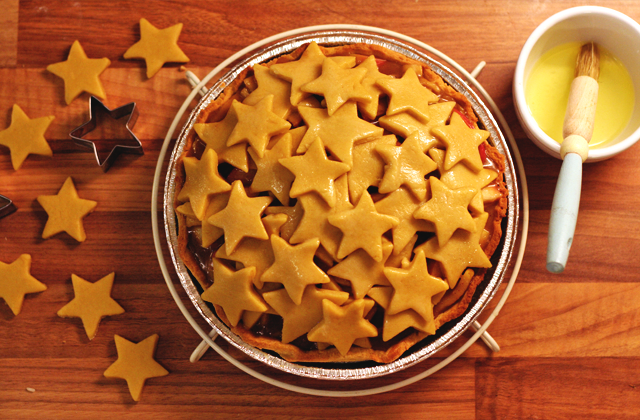 Glaze the stars with egg white and bake at 180°C for 20-25 minutes until the stars turn golden at the edges. We finished ours off by dusting it with icing sugar and some edible glitter for seasonal shimmer. 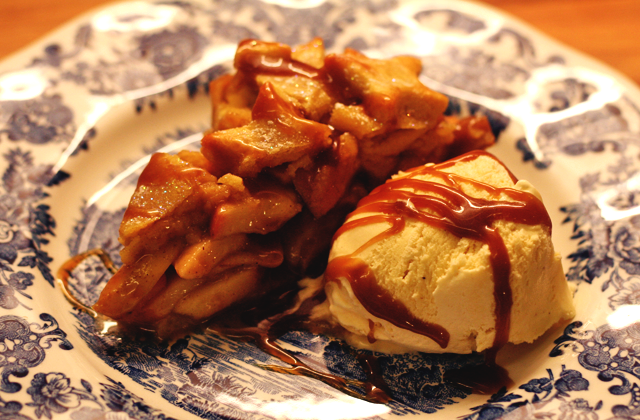 We served our pie with vanilla ice cream and homemade salted caramel sauce. To make your own, melt a couple of generous spoons of butter on the hob and add 160g of soft brown sugar, 160g of dark brown sugar, and a splash of milk. Stir on a medium-high heat until the grains have melted, and allow to bubble up before removing it from the heat and stirring in a generous pinch of sea salt. This is an extremely yummy treat, and we can never resist stealing a spoon or two from the pan! Our little treat was rounded off with a couple of glasses of hot, spiced cider. We picked up a bottle of local cider, heated up a couple of glasses worth in a pan with a cinnamon stick, some sugar, a little nutmeg and some vanilla extract, and served it piping hot. A warming tipple, and since Grant doesn't enjoy mulled wine, something we can both enjoy. that pie is amazing ! 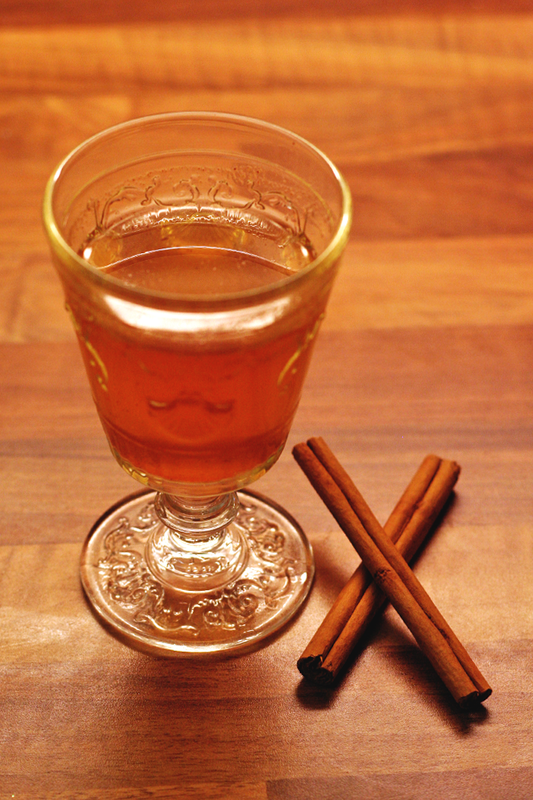 warm spiced cider, now I have to try that because I also detest mulled wine! 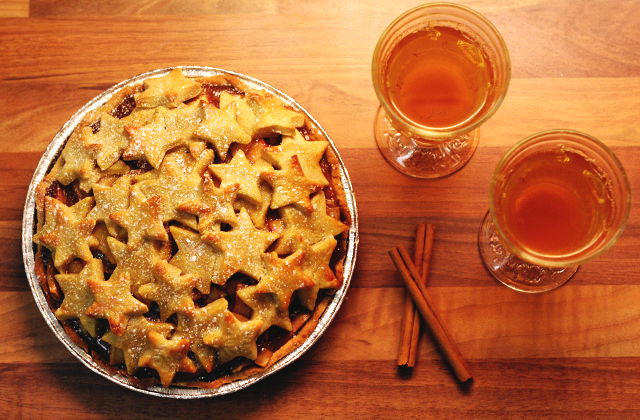 This looks so scrummy, I love home baking apple pies in winter, but I am pretty lazy most of the time and make crumbles! this looks so delicious! Need to give this a go asap! This is such a beautiful pie! Definitely trying this "star" lattice on top. 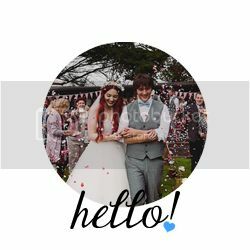 All content and images are property of Megan and Grant McMinn unless otherwise stated.